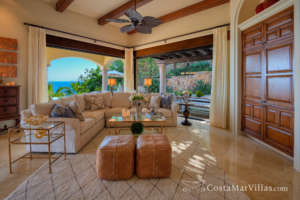 Developed and built by a very successful developer from Texas and other parts of the Western USA, Villas del Mar properties offer the elegance and beauty of what has come to be expected of luxury properties in Los Cabos while incorporating all of the comforts that you would expect in your own home. Carved around the hillsides of Palmilla Mountain, you will surely appreciate the privacy, exclusivity, and quiet that is associated with the neighboring Palmilla One & Only Hotel. 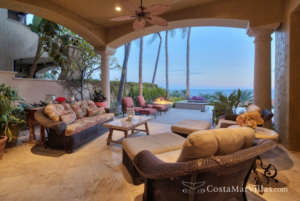 Due to the elevations, every home offers incredible and expansive views of the Sea of Cortez. Depending on location, you may also enjoy white-water beach views, golf course views, the azure waters of the Bay of Palmilla, and the lights of downtown San Jose. Villas del Mar made their name in development by building top-shelf quality as well as something that no one else had ever offered in Los Cabos: world-class amenities. Club 96 remains the Gold Standard of Cabo beach clubs. Nowhere else can you find such luxury, relaxation, and class in a beach club setting. The pampering that you will receive here is like no other. 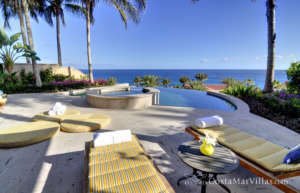 This is where you will make memories enjoying lunch under an umbrella, swimming in the multiple pools, playing in the always calm waters of the Bay of Palmilla on kayak and paddle-board, or relaxing with your friends and family around a fire pit dug into the beach sand during a cool evening which make Los Cabos famous. Before a fun day at the beach, you will of course want to get a good work out. The Del Mar Development company thought of this as well. Proudly offering the Espiritu Fitness Center, Villas del Mar guests will enjoy access to the most comprehensive workout facility in Los Cabos. With a lap pool, tennis courts, basketball court, indoor and outdoor yoga areas, extensive selections of free-weights and exercise machines, and fully-equipped locker rooms, there is nothing left to wish for in an exercise facility. You will not believe the views from here! 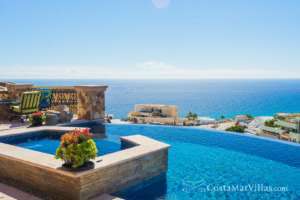 While the properties of Villas del Mar have set the bar in the Los Cabos market, the real star of the show is the experience that you, your family, and friends will enjoy while in these remarkable properties. This is where you will make the memories that will be talked about at Holiday meals for the rest of your lives, where you and your spouse will spend landmark anniversaries, and where you will spend your days at the office wishing you were. Come to Villas del Mar and learn what paradise truly feels like.